Are you planning your LBJ School class reunion but don't know where to begin? The Alumni Reunion Toolkit was developed by LBJ staff and alumni volunteers and includes information, sample documents, and other resources to help you make the most of your reunion weekend. Start early and begin with a planning timeline and forming a planning committee. If your reunion is very small or you're working with a short timeframe, use The Simple Version. The first step in planning your reunion invovles evaluating if there is enough interest in having a reunion. To know if you have the prerequisites for a successful reunion, you should know if you will be able to form a committee. This is not absolutely necessary, but if you are planning a reunion entirely alone you, will need a lot of free time. Make a few phone calls or email former classmates to recruit potential committee members. You may already have a handful of classmates ready to organize your reunion, but if you don't, the alumni relations coordinator can help by reaching out on your behalf to classmates who have indicated they would like to be involved. If you can get a committee together and you are commemorating a milestone reunion, your chances are pretty good for generating a lot of interest in a reunion. 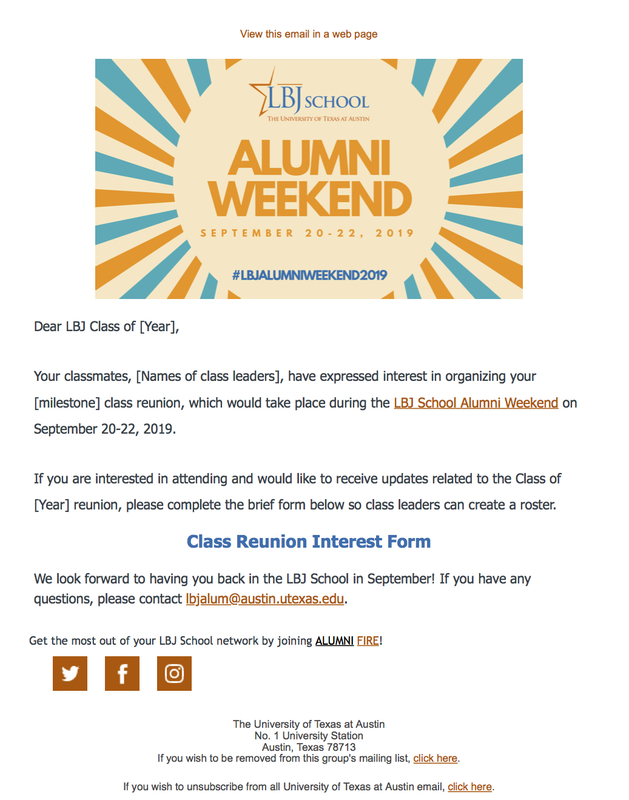 Connecting with classmates can be challenging because UT Austin and LBJ School alumni data is protected information, but the alumni relations coordinator can help you collect names and email addresses by emailing your classmates on your behalf. The following message and Google Form link will go out to classmates, and class reunion leaders will be given access to the class-specific Google Form and list of responses so they can begin putting together a roster. Depending on the culture of your class, using social media, such as creating a Facebook group or event page, may also be an effective tool. If you still have 'lost' classmates, send an email to everyone on your roster and include a list of names for those you're still seeking. Your classmates may be able to help you locate them. Your planning timeline will depend on the size of your class, which milestone reunion this is, and how soon you form a committee. The following proposed schedule assumes a full year of planning. This reunion planning checklist was developed to assist alumni when they are organizing a reunion weekend. Not all items on the checklist will be relevant to every reunion. Alumnifire is the LBJ School's alumni and student networking platform. Use the system's Bulletin Board feature to create an Event for your class reunion or post a Class Note for your classmates. myRollCall is an event-organizing platform that acts as the promoter, ticket agent, custodial banker, and fundraising bookkeeper for volunteer-driven communities like alumni groups. Eventbrite is a global ticketing and event technology platform that allows event organizers to plan, promote, and sell tickets to events. Attendees can also find and purchase tickets on the platform. Doodle is an Internet calendar tool for time management and coordinating meetings. The culture of your class leans toward "less is more"